The big apple. The city of bright lights. And also the city home to one of the best events to take place. We’re talking about Toy Fair of course! One of our favorite events took place last week and it was filled with excitement and admiration for the new products to be released in 2019. This year we showcased over 100 products ranging from Pac -Man, XBOX, Nintendo and more. With so many products put on display, it only felt right to give back to those less fortunate. This year, we donated our whole booth to The Toy Bank. 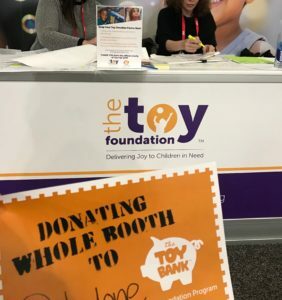 The Toy Foundation is an no-profit organization that collects toys from events and donate them to families in need and different charities around the world. We were proud to do a good deed and box our items up for them. The donated toys will be sent to children’s charities in the tri-state area serving kids who are impoverished, neglected, or otherwise in need, and to charities across the country to benefit those in foster care. The Foundation is aiming to surpass last year’s collection of more than 50,000 donated toys and games. Paladone is beyond proud to be among the list of exhibitors that donated their booth as well. Till 2020, Toy Fair and Toy Bank!